Ray Bradbury's famous dystopian novel, Fahrenheit 451, provides an excellent opportunity to introduce or review core literary elements through the lens of exciting and scathing social commentary. Students can analyze the rich symbolism of "The Hearth and the Salamander," "The Sieve and the Sand," and the motif of fire, flames, and burning. A more comprehensive discussion could involve tracing how the meaning of fire changes as Guy Montag's journey progresses. At the beginning of the novel, fire represents demolition; by the end, it signifies a new beginning. Another important facet of Fahrenheit 451 is the motif of mirrors—more specifically, how mirrors reveal a person's inner self. Ask your students to consider how Fahrenheit might be a "mirror" for society today. As digital natives, students will be eager to discuss and debate trends of social interaction, effects of technology and media, and consequences of knowledge. 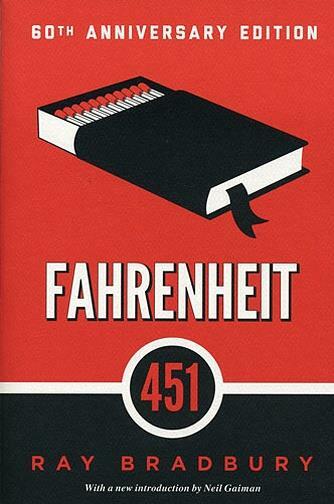 Furthermore, they'll appreciate the irony that Fahrenheit 451, a book that warns against the danger of censorship, is a banned book in some school districts. Bradbury revealed in interviews that his primary motivation for writing Fahrenheit 451 was concern for "how television destroys interest in reading literature." In the novel, Montag's mentor, Faber, cites three ways reading is the key to happiness: quality, leisure, and gleaning wisdom from the two. Explore how Montag acquires or recognizes these elements over the course of the story. Which characters or events facilitate his understanding of the vitality of books? Learn more about this fiery novel by browsing our handy teaching guide! Guy Montag lives in a dystopian future in which reading or even possessing books is illegal. Instead of extinguishing fires, Montag and his fellow firemen burn down all buildings reported to contain books. One day, Montag meets his odd neighbor, Clarisse, who lives life on her own terms. Listening to her perspective makes him question his own happiness and helps him understand his true self." This encounter sparks a series of traumatic events and realizations that ultimately lead to Montag's illegal possession of books. He confides in an old physics professor, and together, they conspire to rebel, as a war is on the horizon. Content Warning: This novel contains some violence, as well as the burning of a religious text. Explain the role that each supporting character—Mildred, Clarisse, Beatty, and Fader—plays in Montag's realizations about society. Elucidate the role of fire in the novel and how the motif develops over time. Analyze the meaning of the novel's epigraph and how it conveys a theme from the novel. Relate the events and the trends of Montag's society to society today. Explore the motif of emotional "emptiness" in the novel, using specific examples. Discuss themes involving technology, censorship, social interaction, and knowledge. Censorship — This novel examines the absence of books and, more deeply, of political and cultural clashes; this absence is synonymous with emptiness. Man vs. Society — Montag turns against society by possessing and reading books. He becomes a wanted man and a pariah. Fire and Burning — At the beginning, Montag sees fire as both entertainment and a necessary means of destroying books. As the story progresses, he realizes that fire can be evil. In the end, he sees that fire can help him survive. A film adaptation Fahrenheit 451 (1966), directed by François Truffaut and starring Oskar Werner, premiered in 1966. The film has many significant differences from the book, however, the biggest being a dramatic change in the backstory and fate of Clarisse. Here are some screenshots and promotional posters from the film! In 2018, HBO premiered a film adaptation of Fahrenheit 451 starring Michael B. Jordan as Guy Montag and directed by Ramin Bahrani. It was nominated for five Emmy awards, and Jordan won a Black Reel Award for his performance. Watch the trailer! TIME article: "Daily Show Writer Dad's Response to a 'Fahrenheit 451' Permission Slip Is Perfect"
Video: "Discussion with Ray Bradbury"